It’s 1141 and freezing cold. Gwil, a battle-hardened mercenary, watches in horror as a little girl with red hair is dragged away by his own men. Caught in the middle of the fight for England she is just one more victim in a winter of atrocities. But a strange twist of fate brings them together again. Gwil finds the girl close to death, clutching a sliver of parchment – and he knows what he must do. He will bring her back to life. He will train her to fight. And together, they will hunt down the man who did this to her. But danger looms wherever they turn. As castle after castle falls victim to siege, the icy Fens ring with rumours of a madman, of murder – and of a small piece of parchment the cost of which none of them could have imagined . 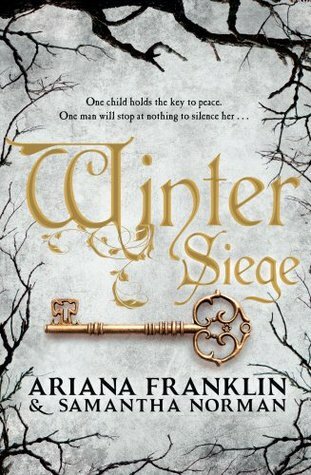 . .
Winter Siege is probably one of the most creative historical fictions I’ve ever read. It was such an incredible book and I loved all of the characters. I’m not normally a huge fan of multiple perspectives but it worked really well in this book and in some ways enhanced the story. My favourite character would probably have to be Maud though I did love Penda. I think the authors did a pretty good job writing a variety of powerful female characters which is always a plus. I enjoyed how slowly the separate storylines intersected and how important each character became through their actions and decisions. It was so intricate and I just loved it. The plot was well thought out and perfectly paced, everytime I put it down I wanted to pick it up again. I found the developing relationship between Gwil and Penda lovely and heart wrenching as she slowly recovered during their travels to find the man who hurt her which in turn draws them closer to other characters like Maud. Maud’s story starts off with her being forced into a marriage to a man she hates and I knew from her first snarky comment that I was going to love her, she was hilarious and her character made the book for me. Her character development was so interesting and her relationship with William (her husbands son) was absolutely adorable. This book contains some of the most amazing characters!